Data has provided great leverage for the organization but the important perspective is the insight it provides. 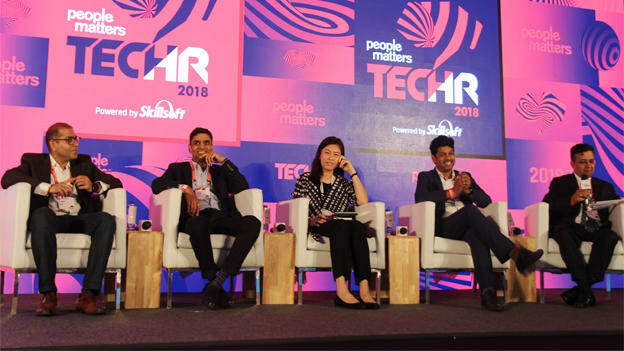 An insightful session on data and information was discussed with charismatic leaders like Aileen Tan, Group CHRO, Singtel, Ketan Kapoor, Co-founder and CEO, Mettl, Krish Shankar, Group Head HR, Infosys, Lokesh Payik, Chief of Digital Enterprise, Robert Bosch Engineering and Business solutions and SV Nathan, Partner and Chief Talent Officer, Deloitte (Chair) on day one of TechHR 2018 . The session titled “From Data & Insights to Cost & Productivity” paved paths for many insights and how technology has not just discarded nonchalant processes but a more defined pathway for success and growth. Data is one tool that can be leveraged by organizations and create more insights to future aspects and growth. One of the powerful tools that help both organization and employees is assessment. However, evaluation can only deliver data, the critical element is to understand measurability. Data and insight have to be translated into action to achieve desired results. Data has always been available. However, what has changed in today's date is computing power and set algorithms that help you access data quickly and specific as per requirement. The only task that can be challenging is identifying the right set of questions. HR now has access to many data and can provide input in critical management decisions. However, the manager has to take accountability and their choices plays a crucial role in implementing decisions based on the data acquired. HR should ensure that the manager has access to all the data and inputs to help them make the right decision at the right time. Data gives you the right insight regardless of the question and helps the organization understand profits, customer experience and even with recruitment. Management should be open about data and provide the right ideas for the workforce to understand the situation. While creating a policy, it is essential to consider personalization as each team has a different requirement. If management has the right insight, they can design the right strategies and work pattern which will increase efficiency and help retain talent. The utmost importance of data is to use it correctly and not abuse the information. HR has to utilize the data in developing talent rather than identifying and recruiting employees. The importance has to be on talent management and grow along with your workforce. It is easy to get carried away with the abundance of data and the access it has to infinite knowledge; however, the organization must keep in mind that the data is for benefiting each one and has to be conveyed in a particular manner. Small improvements have great merits and, hence, HR and management have to improvise their communication with regards to data on a regular basis. Use a chatbot or software that will clean data on a regular basis to gain access to assured data. Ensure that the information is governed and protected to keep the intact privacy of all employees and associates. The most crucial aspect to remember is that machines help enhance the output with the help of data. However, the efforts and result are achieved with the help of your workforce. NEXT STORY: Successful Digital Transformation: What does it take?